Welcome to the cTrader Video Tutorial introduction page, here you will find video help on how to use products provided by ClickAlgo.com as well as help on how to use the cTrader trading platform. 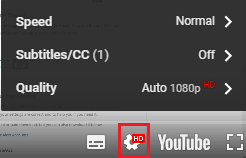 The video has been uploaded to 1080p High Quality, so do not forget to set your U-Tube video quality to 1080p HD by clicking on the settings icon shown below in the red box and choosing 1080p quality. You can open the video full screen by simply clicking on the full-screen icon located bottom right. If you wish to view the complete playlist which contains all the videos just click on the icon top left of the video screen. If you wish to go directly to YouTube and watch the YouTube image shown on the bottom right of the video screen. Why not come and visit our YouTube channel where you can access all our videos?